Prosciutto, brie, burrata with lemon olive oil, squashed garlicky white beans, caramelized fennel, warm crusty bread, fresh fruit, a coke and the Oscars. Oh and truffle salt. Can’t forget the truffle salt. If I could package all of my favorite things into a hobo sack and run away to an island that is exactly what I would take with me. The second the holidays are over Steve and I flip into movie mode. It’s how we get through the last two months of short, cold days. We love to sneak away on a school night with sandwiches and fresh fruit tucked in my gigantic purse and get swept away by a great movie. And I won’t lie – there are always a few nights where dinner consists of butter soaked movie theater popcorn and a coke! For the record, I am officially an Oscar snob. I love seeing all of the best picture nominees and breaking down the best acting performances with anyone who will indulge me. With so many amazing movies and incredible performances this year I knew I needed to come up with a great menu to fill and entertain us through the red carpet arrivals and up until best picture gets awarded. I also didn’t want to slave away in the kitchen all day, so I called on of my all-time favorite meals – which probably shouldn’t even be called a meal since it’s really a blend of small appetizery foods that you can pick on for hours. 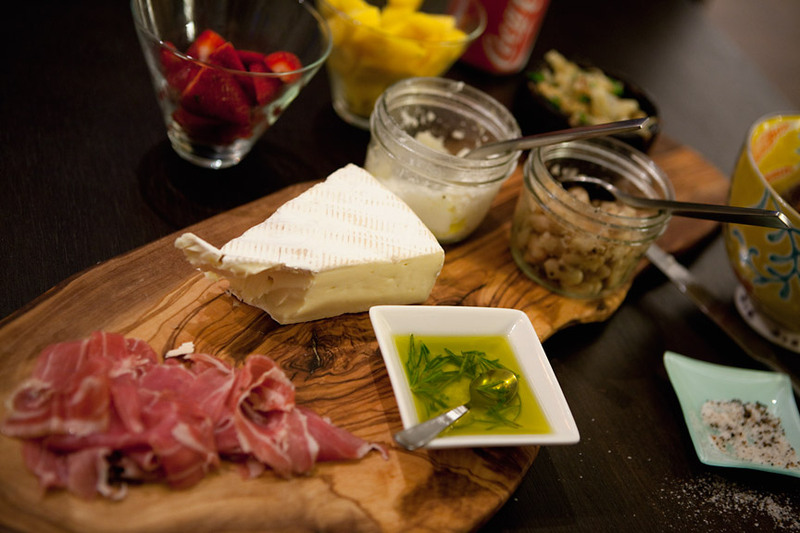 I usually always start with a healthy dose of Prosciutto de Parma and a couple of our favorite cheeses. Then we add in seasonal fruit – I’m completely addicted to mangos right now. And of course fresh crusty bread is a must! For the occasion I made a Jamie Oliver recipe of white beans sautéed with garlic, squashed in the pan and given a good douse of Red Wine Vinegar. You then smear it on warm bread and finish it with rosemary olive oil. The beans are creamy, a little crunchy and packed with lots of flavor. This platter makes a great meal for two or an appetizer platter for guests. Enjoy! Start by making your rosemary olive oil. 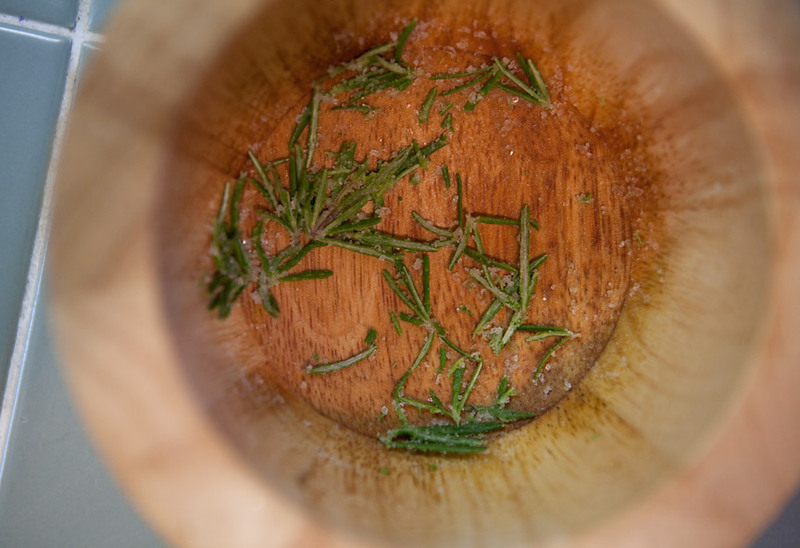 If you have a pestle and mortar you’ll want to bash up the rosemary with the sea salt and then add the 1/4 cup olive oil. Set aside. If you don’t have a pestle and mortar you can just mix the ingredients together in a bowl. In a sauté pan, heat up a tablespoon or two of olive oil and add your minced garlic. Add the beans right away and let them cook until they get a little browned. Now squash them with the back of a fork and add in the red wine vinegar, salt and pepper. Mix all together and remove from heat. 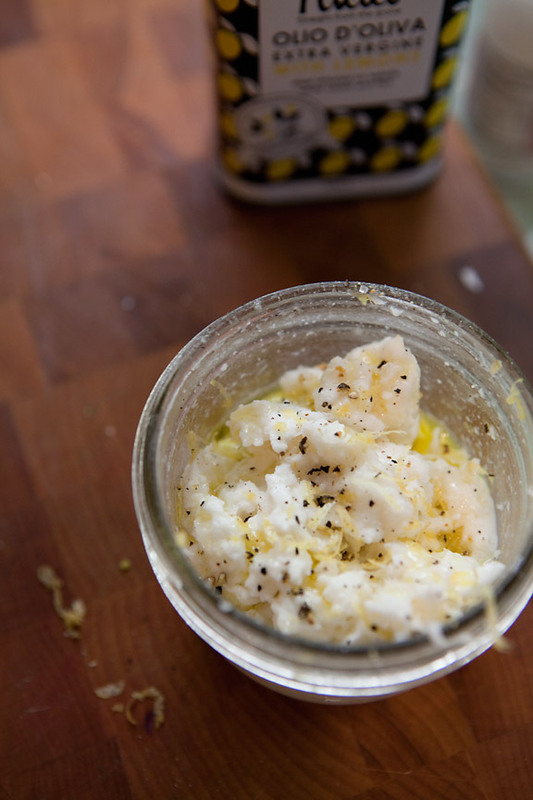 Drizzle a little olive oil and salt on your bread and place it in the oven on broil for 5 – 8 minutes. Keep an eye on it so it doesn’t burn! 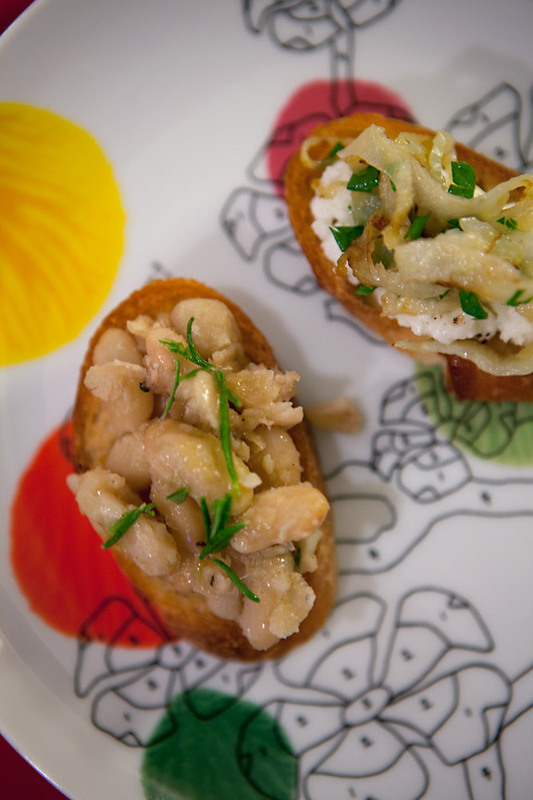 To serve, spread the bean mixture on the bread and then drizzle a little of the rosemary olive oil. sounds good Chass! Movie night at your place soon! let’s do it!! can you lug your coffee machine over for after dinner drinks?? My rosemary bushes will come in handy for this one. Can’t wait to try it.